A week at the lake can be a nice respite when the temperatures are in the 80s and the humidity is nearly as high. And if you don’t do much fishing or they are not biting if you do, means you better have better brought along enough food from home or that your lake retreat isn’t too far from the nearest supermarket. We recently spent a week at a cabin of a friend on Lake Beltrami north of Bemidji in northern Minnesota. We figured to be doing a little fishing to put some food on the table, so we didn’t bring as many vittles as nonanglers would. A sore back kept me off the water and onshore most of the time, so we had to venture into town to pick up some supplies, which by the end of the week weren’t quite depleted. And that brings me today’s recipe. 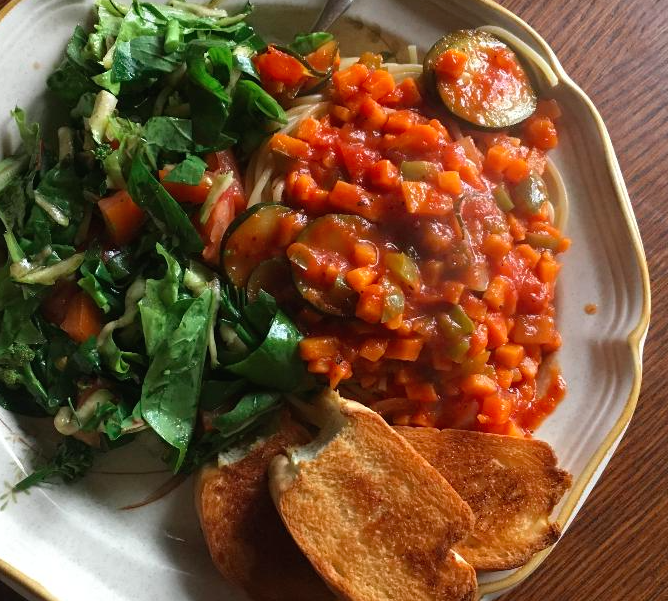 An extra sweet potato, a small zucchini and a little onion and green pepper that we bought after we got to the lake, along with some tomato sauce and homemade juice, were all I needed to a nice marinara sauce. It almost made me forget about not catching any fish. Saute onion and green pepper in olive oil for 1 to 2 minutes. Add sweet potato and continue to saute for another 2 to 3 minutes. Add zucchini and saute for 1 minute. Add tomato sauce, juice and seasonings. Simmer for 15 minutes. Serve over spaghetti.